If ever there was a topic to polarise views when it comes to weddings, it's kids. And just when you thought you'd surpassed the family ructions by making the decision to welcome the little ones into the celebrations, apparently, there's more upset to come. A bride-to-be has posed a question on the never-short-of-material Mumsnet about whether parents should remove their kids from a wedding ceremony if they're making noise during the all-important vows. Not screaming, or crying. Just any noise at all. 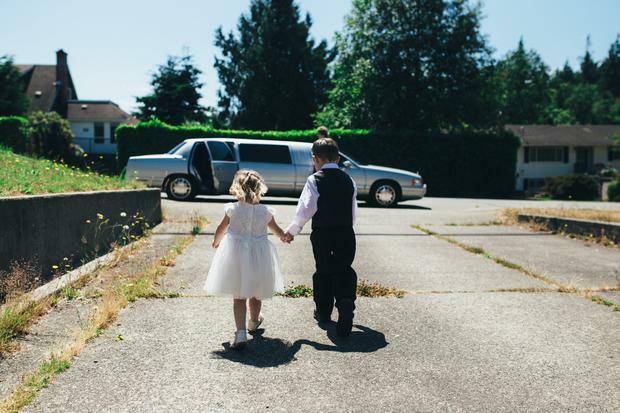 The bride says she has declared 'no children at the ceremony or speeches' as she's tired of parents waiting 'until their child has a meltdown' before removing them from the room. "Yes it's cute when they make their little noises or exclaim enthusiastically," the bride explained, "but not when I'm actually reciting my wedding vows." "My nephew will be just two. He's cute. He's very funny. Everyone dotes on him. He's quite rambunctious and vocal. I've been assured he 'won't cry'. I have three other cousins around a similar age and I'm sure their parents will say the same thing, that if they kick up a fuss they'll be 'taken out'. But will they?" Related: Wedding talk: Can you say no to being a bridesmaid? The bride-to-be said her policy of no children at the ceremony has raised a few eyebrows from guests, with the consensus, she explains, being that "it's 'sad' not to appreciate the joy children can bring to a wedding." "Yes I know I should one of those relaxed brides that just titters and smiles beatifically, but I just won't be, I'll be p****d off." The bride's words have stirred up a variety of reactions from fellow forum users, with posters telling the bride she won't notice any noise at all while her and her fiancé are exchanging vows, and others backing her decision to completely bar kids from the 'serious' parts of the day's celebrations. "Unfortunately," said one poster, "I think the people whose children make the most noise are those who are least likely to remove them. I went to a wedding and sat next to a friend and her kids and couldn’t hear the service because of the chattering. They weren’t being loud or upset or shouting but they were being disruptive to others." Another had a similar situation; "I’ve been to a wedding ceremony and reception that was totally spoiled by a family with three kids. We couldn’t hear the vows or speeches over the children’s noise and adults shushing them. The couple getting married seemed pretty oblivious though, thank goodness." Many posters were of the opinion 'your wedding, your choice', advising the bride to set down strict rules on whether or when children would be welcome during the celebrations. Posters who have children said that they would always leave the wedding ceremony if their child made noise, and would be happy with the policy of no children at the ceremony. However the majority said they would not be happy to leave their children with a stranger during the ceremony if the couple made that an option.